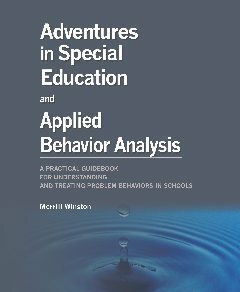 This book is intended to asist behavior analysts, special educators, regular classroom teachers, and other professionals in their treatment of persons with disabilities who exhibit behavior problems in classroom settings. It is the product of over 26 years of experience in the field of applied behavior analysis and intellectual disabilities, the last 11 of which were spent working with children with a variety of disabilities in public school settings. Although the emphasis of the text is on the assessment and treatment of problem behavior, other school-related topis are touched upon, including working with the major players such as teachers, parents, principals, and behavior analysts. Other topics include issues related to diagnostic labels as well as included classrooms and how they may affect a child’s behavior. Also covered are the use of restraint and seclusion in classrooms, and punishment. This book should be in the tool kit of every professional—social worker, behavior analyst, teacher—who works with the behavior of children. Its witty, conversational style belies the combination of solid science and practical experience that is rarely found in books written for the practitioner. A great present for newly minted BCBAs. What a great book! Don’t let the author’s conversational, sassy, and often hilarious writing fool you. Its chapters are thoughtful, sophisticated, and practical. This book raises important issues often missing from standard texts and parent manuals in applied behavior analysis and is a gold mine of invaluable clinical guidance. Page after page reveals the subtle reasoning that underlies how behavior analysts think about behavior and the resulting procedures that make this technology so effective. Despite the title, this book is certainly not just for special educators. All professionals who face the challenge of managing behavior, as well as the parents they work with, will learn so much from it that improves their skills. Merrill Winston has created a book that delves deeper into the perpetual question of behavior function, and has done so in ways that are funny, thought provoking, and technically sound. Every behavior stakeholder can get something from this book; experienced behavior analysts, parents, teachers, clinical staff and supervising administrators. Merrill reminds us it is not only the questions about the dimensions of behavior that need to be asked and answered, but also, why this individual and not others? Why now and not then? Why here and not there? The fact the book is often laugh-out-loud funny only adds to the reinforcing aspects." BCBA-D, CEO, Behavioral Services of Brevard, Inc.